Substantive clauses, this is a tricky idea. Some subordinate clauses play the role of an adjective in the main sentence, and those would adjectival clauses, also called noun modifiers. 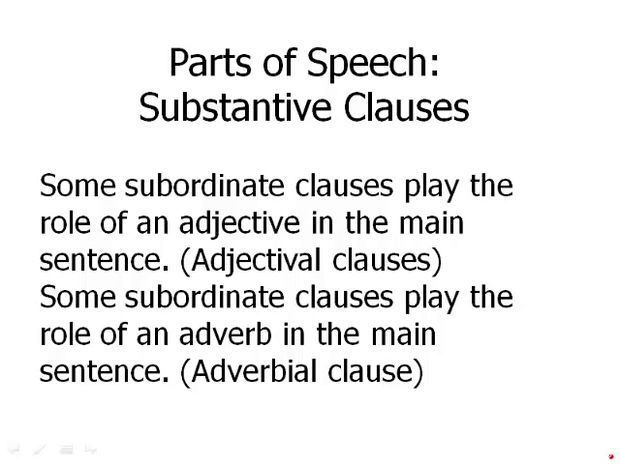 Some subordinate clauses play the role of an adverb in the main sentence. These are called adverbial clauses, or verb modifiers. We've already had some videos in this module on those. No subordinate clause can ever play the role of the verb in a sentence. Verb is kind of sacrosanct. Only a verb can be a verb. But certain subordinate clauses can play the role of a noun. It can take the place of a noun. Now, these clauses that can take the place of a noun, there are several different ways to talk about these. Some people call them substantive clauses, some people call them noun clauses, some more formal grammar books call them nominative relative clauses. I'm going to use the term, the traditional term substantive clauses. They have this name because unlike mere modifying clauses, which are like decorations in this sentence, these clauses have a substantial role in the sentence. They take the place of a noun. A noun is a real concrete, substantial thing, so a clause that plays this role is called substantive. On the one hand, most clauses you will see on the GMAT are substantive clauses. Substantive clauses might only account only for something like 5% of the clauses you are gonna see on the GMAT. On the other hand, substantive clauses are sophisticated grammatical structures. And the frequency of substantive clauses increases with the difficulty of the sentence correction question. So if you're doing pretty easy questions, you're not gonna see them very much. But as you're doing the more difficult sentence correction questions, you are gonna definitely see some substantive clauses. Separate clauses begin with interrogative words, i e question words, or relative pronouns and adverbs. So all of these are examples of words that can begin substantive clauses. Many of the substantive clauses you will see on the FMAT begin with the word that. So a substantive clause can be a subject. Whoever wins the election, that's the subject of the sentence. That he has no sense of direction, never stops him from blah, blah, blah. So that he has no sense of direction, that clause is also the subject of the sentence. Substantive clauses can be the direct object. For example, the 14th amendment says and then everything after that, that all citizens, blah, blah, blah, that whole thing is a clause that is the direct object. I do not know where this nation is going. Where this nation is going is a substantive clause that is the content of what the speaker does not know. Incidentally, I'll point out that, one very common idiom, are the verbs that take that. To know that, to, intend that. This sort of thing. To suggest that. All those that clauses that follow a verb, are substantive clauses. Substantive clauses can even be the object of a preposition. She doesn't care about what the doctor says, so the clause is the object of the preposition about. Compared to whoever can play the Appassionata, blah, blah, blah the substantive clause is the object of the preposition to. Here's a practice question. Pause the video and work on this question. Okay, why the various Generals of the Army of the Potomac before Grant were so singularly unsuccessful against Lee, that whole thing. That is the subject of the sentence, that gigantic substantive clause. So what we need after that subject, of course what you need after any subject is a verb. So we don't need to put an it there, that's incorrect. We certainly don't need a 'they are', no. What we need is clause and then a verb. The verb is. So c is actually the correct answer to this sentence. In summary, some subordinate clauses play the role of nouns. These clauses, substantive clauses, can be subjects, direct objects, or object of prepositions. These con, these constructions are most common on the most difficult sentence correction questions on the GMAT.